Lawrence Rubin Greenberg Van Doren Fine Art is pleased to present an exhibition of important sculptures and drawings by the Italian artist Fausto Melotti (1901 – 1986). Melotti’s art was recently the subject of the major retrospective Fausto Melotti 1901-1986 at the Aichi Prefectural Museum of Art in Nagoya, Japan. Featured in this New York venue are sixteen sculptures which span the artist’s career from the thirties to the eighties and eight early drawings dating from 1933 to 1935. 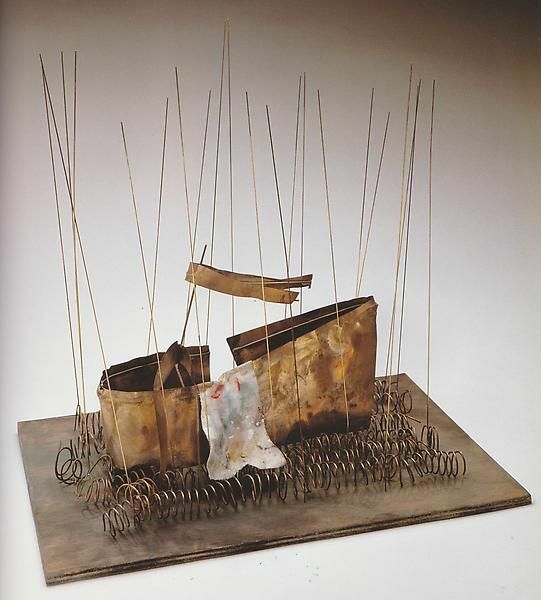 A central figure in the history of Italian twentieth century art, Fausto Melotti was first recognized for collaborations with artists and architects, such as Lucio Fontana and Gino Pollini, to create site-specific sculpture designed for Italian modernist architecture. His subsequent sculptures reflect the artist’s formal training in mathematics, physics, and music, and his interests in various media, including metal, ceramic, and fabric. The lyrical, abstract sculptures, primarily in brass and fabric, created by Melotti during the last twenty-five years of his life are formally distinct for their use of line and negative space. Not aligned with one particular movement, Melotti’s sculptures have been compared to those by Calder and Miro which also display an affinity for the dream-like and whimsical. Highlights in this exhibition from the artist’s early years are the geometric drawings, all graphite on paper, and the stainless steel sculpture Scultura N. 14, 1935. The sculpture is an exploration of music, as elongated curves and lines cast shadows which vibrate against a creased pillar. His Falso Trofeo II, 1961, is a tall vertical configuration of the normally horizontal landscape. Le Parallele, 1972, presents a sleek silver box whose uniform geometry is humorously interrupted by a gathering of colored ceramic balls. The monumental Contrappunto Domestico, 1973, is an imaginative commentary on modern housing. Another large-scale work, La Sposa di Arlecchino, 1979, places figures side-by-side on a fantastic chariot. A fully illustrated catalogue of this exhibition is available. Melotti’s sculpture can be seen in the exhibition Minimalia: An Italian Vision in 20th Century Art which opens at P.S.1 on October 10. His work was also featured in the Guggenheim Museum’s 1994 exhibition The Italian Metamorphosis, 1943-1968 and the accompanying catalogue. Among the collections which include his work are The Museum of Modern Art, New York; the National Gallery of Art, Rome; and the Gori Collection, Pistoia, Italy.